★★★★★ Ended up buying 2 of them for 2 different rooms in the house. These are awesome stands. Simple design, doesn't take up a ton of room and elegantly displays guitar. Super easy to just pick it up and play and put it down when life calls to do other boring things. Definitely recommend these stands over the cheap plastic ones. We tried those and they were just terrible....did not stand up right and did not hold the guitar well. Second time was the charm. 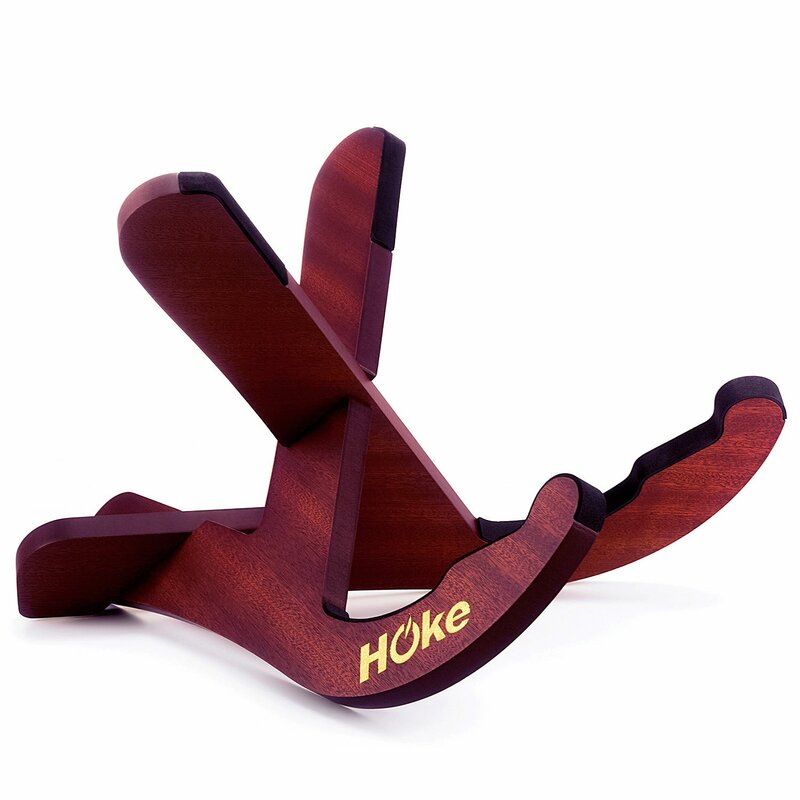 ★★★★★ I was a little on the fence about what Ukulele stand to get for myself. I had determined that I wanted one made in wood, but found when I looked for one made in Mahogany many of the recent reviews were not very nice for the construction quality of the ones show. This stand here you can tell in your hands is real solid wood. In its appearance looks beautiful in both shape and texture. Laser cut emblem and construction that is evident. Very satisfied with my choice and accents the Mahogany on my Pineapple shaped Soprano Ukulele nicely. In function it worked surprisingly well. My Ukulele felt well placed in it's arms. I perhaps would not recommend it for a busy place where you might gig, but for a home it makes a nice addition to functional decoration. Added a few glamor shots, one were it is rest nestled between my two Trumpets, and another couple to show off the stand better. ★★★★☆ This instrument wood holder was pretty easy to assemble. Made of very beautiful dark wooden color. Big enough to hold my sons guitar.Like few other reviewers mention. The padding on these stand are pretty thin and also the stand once you put them together there is no lock or clip to keep it in place. If you move the instrument gently even the stand will come apart into two pieces. As long as you keep the stand at one place you should be fine. ★★★★★ Very attractive stand. I prefer to see a classical guitar on a wooden stand and this one is very nice. The stand is stable and well padded. The only improvement I would like to see is nothing to do with the stand itself: it would be nice if it came with a storage bag of some sort to keep the stand from getting scratched in my gear bag. I am likely to get a couple more of these. ★★★★★ This is the second stand I have purchased and they are very nice. Nice padding and the wood is nicely finished. Easy to put together and looks good anywhere in your home.